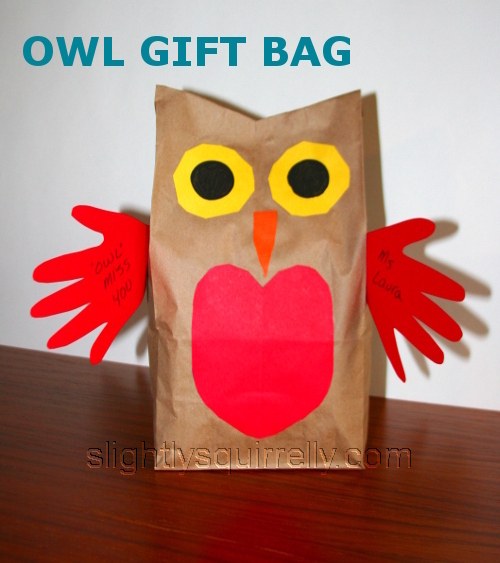 This owl bag is a cute way to package baked goods or any other small teacher appreciation gift. The bag is easy enough for a preschool child to help make, and the hand tracings for the wings make it extra personal. Doesn’t it almost look like it is reaching out for a hug? This is the first year I’ve had to come up with teacher appreciation gifts. I really wanted something that my 3-year-old could help me make so that it had a very personal feel, but I also wanted something the teachers would enjoy. These gift bags fit the bill. Adorable, personalized cuteness on the outside and total flexibility on what goes inside. 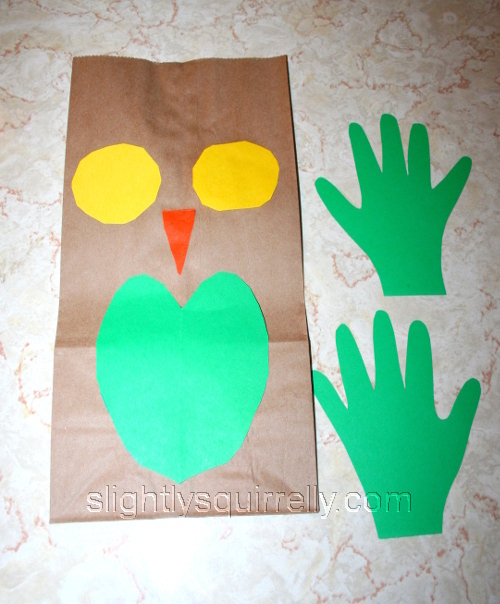 Paper lunch bag: One per owl. We used “giant” lunch bags (4” x 6 1/8” x 12 3/8”) which we found at Wal-Mart . We intended to fill the bags with mini loaves of quick bread so we needed this larger size. Regular lunch bags are approximately 3” x 5” x 10.5”. Depending on the size you need, there are also some brightly colored options which might be fun. When deciding what size you want, remember that you’ll lose the top two inches when you fold over and shape the top of the bag. 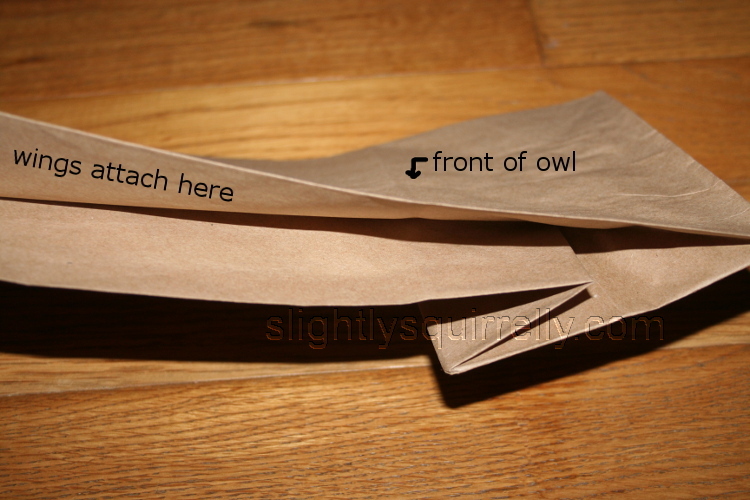 Accent paper for wings and belly: One or two sheets (8.5”x11”) for belly and wings of each owl, depending on how large the traced hands are. The belly takes 1/4 of the sheet. We were able to fit two preschooler hands on the remainder of the sheet. We used Crayola computer and craft paper (classic colors), but patterned scrapbooking paper might make these extra fancy. Orange paper: Scrap piece for beak. Yellow paper: One sheet will yield six pairs of 2.5” in diameter eyes. Cardboard: One piece slightly smaller than the bottom of the bag to reinforce the bag if the contents will be heavy. Tape. We used invisible tape, but something wider would probably have worked better. Circular item to trace for eyes: Something about 2.5” in diameter like a shaving cream can. Circular item to trace for pupil: Something about 1.25” in diameter like a soda cap. Draw or trace the pieces for the eyes, wings, beak, and belly. When tracing the hands for the wings, be sure to include some of the wrist which is where the glue will be applied. You may want to experiment with the finger placement to get a look you like. We found that fingers spread too far apart looked a little goofy. Cut out the pieces. I cut the wings, but my child was able to cut the eyes, beak, and belly well enough for a cute, if imperfect, look. Make the pupils of the eyes. We did this by painting the rim of a soda cap and using it like a stamp to make a black circle on the yellow eye. We then filled in the stamped ring with black paint using a paint brush. We ruined a couple eyes along the way so I would recommend making the pupils before gluing the eyes to the bag. An easier way to make the pupils would be to trace and fill with a black marker or trace and cut black paper circles. Glue the pieces to the bag. The wings are glued inside the side fold. 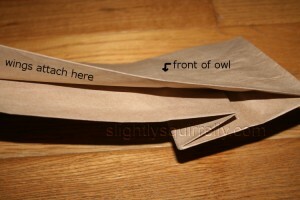 The glue was applied to the front of the wing and the wing was stuck into the front side of the fold. (optional) Label the wings or belly. We went with “OWL MISS YOU” on one wing and the teacher’s name on the other. Other punny labels to consider are “Have a hoot this summer,” “It’s been a hoot this year,” “Whooo loves you,” “Owl always remember you,” “Thanks for making me wiser this year,” and “Whooo’s the best teacher?” That’s one thing I learned from a web search for teacher appreciation gifts: all gifts must come with a play on words. Prepare the top of the bag before filling. Fold over the top of the bag, toward the back, about an inch. Make a 3/4” cut in the fold. 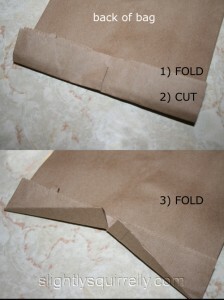 Fold the cut pieces down toward the back, so the top of the closed bag will have an indent in it. Make sharp folds. Open the bag and insert cardboard reinforcement (optional) and the gift contents. Refold and tape top of bag. These bags were a big hit with the teachers. One round of “awww” when they first saw them, another when they realized my child had cut and assembled most of the pieces, and another round when they read “Owl miss you”. I expect there was a round of “ooooh” when they unpacked the delicious baked goods inside. What would you put in your bag? 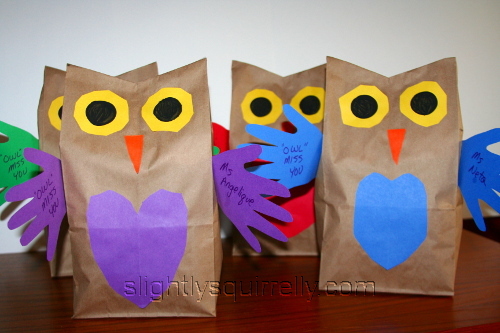 This entry was posted in Crafts, Kid-related and tagged gift bags, owls, teacher appreciation. Bookmark the permalink. These are adorable adorable adorable!